The FB Business add-on's purpose is to provide you with a data feed that contains your webstore products in a format that Facebook understands. With the help of your product dada feed, you can list your products on your Facebook/Instagram Page Shop and run Facebook Dynamic Products Ads. Dynamic Product Ads are a way to display product Facebook ads to customers that have already visited your website, featuring the products that Facebook already knows your customers are interested in based on their behaviour. This process is also known as retargeting. Go to your WordPress dashboard > Plugins > Add New, upload the zip file and click Install. Go to Facebook Business > License and activate your license key. Your product feed must follow strict formatting rules and match Google Taxonomy to work properly. Google Taxonomy is the list of categories used by Google for all shopping campaigns. Before generating your Product data feed, you need to map your product categories to Google Product Taxonomy. Click 'Add new', select a category on your site, then select an appropriate Google category and click Save. Your category will be associated with a Google category. You should do it for all categories you want to use in your product data feed. The Facebook pixel is your tracking code you place on the backend of your website to track visitors to your site. 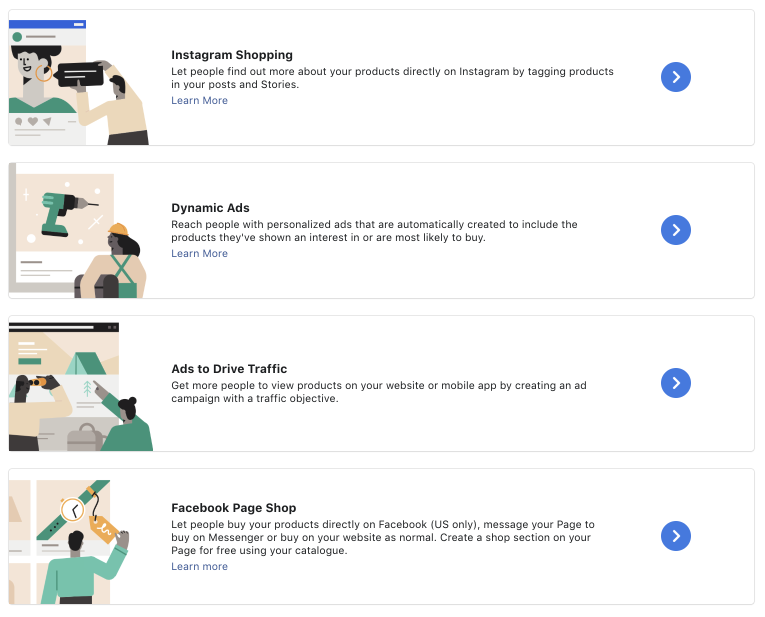 The pixel allows you to run highly targeted campaigns, so it’s important to install it before generating your product feed and running Facebook ads. Viewed Content: After a customer views a product page on your store, you can begin showing them ads featuring the same product to encourage them to take another look. Add to Cart: If a customer adds a product to the cart, but doesn’t purchase it, you can show them ads promoting that product and making the customer come back to your site to complete the purchase. Product Purchase: Once a customer successfully purchases a product, you can show them ads featuring related products, upsells, new arrivals, etc. Besides these main events, you can activate another three: InitiateCheckout, CompleteRegistration and Search. 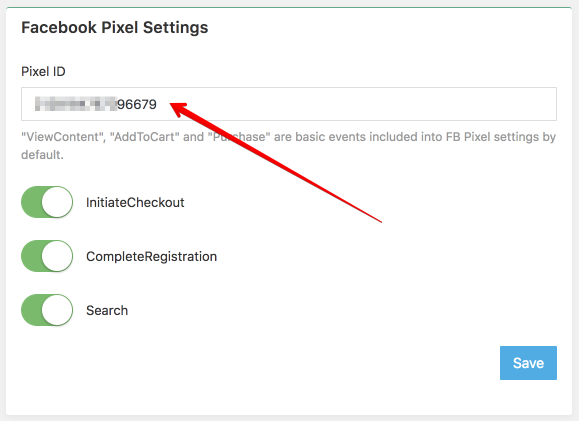 These events are not available for your product feed but can be helpful for other FB marketing campaigns that use FB pixel events. Enter your Facebook pixel ID and click Save. If you have not created your Facebook Pixel yet, please check this guide. Please note that the add-on FB Pixel settings should be the only place you have your FB Pixel ID entered. You don't need to add FB Pixel code to the header section of your site or use any third-party plugins. Go to Product feed section, click Enable and Save. Once you need to make changes with your products and categories in order to generate a new feed, it is better to deactivate this option. Select categories you want to include in the feed and Select currency. If your business supports multiple languages, you’ll need to create a separate product feed for each language. You can also use Split variable products option in case you want to split your products that have variants into separate single items (for example, a T-shirt that has 5 different colour variants will generate 5 items with one colour for each). 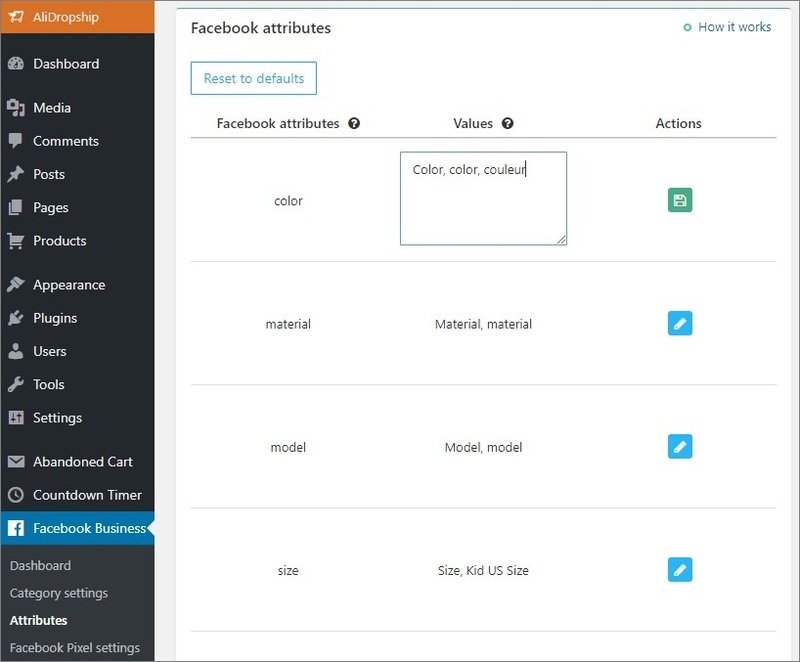 If you are using this option, please check the add-on Attributes section to make sure that your product attributes match the attributes required by Facebook. For example, if you’ve translated ‘color’ attribute into ‘couleur’ on your site, you should add this French word to the Attributes tab of the add-on. Otherwise the add-on won’t be able to match ‘color’ attribute with ‘couleur’ and your feed will be disapproved because of the missing required attribute. Click Generate XML and wait until the progress bar reaches 100%. 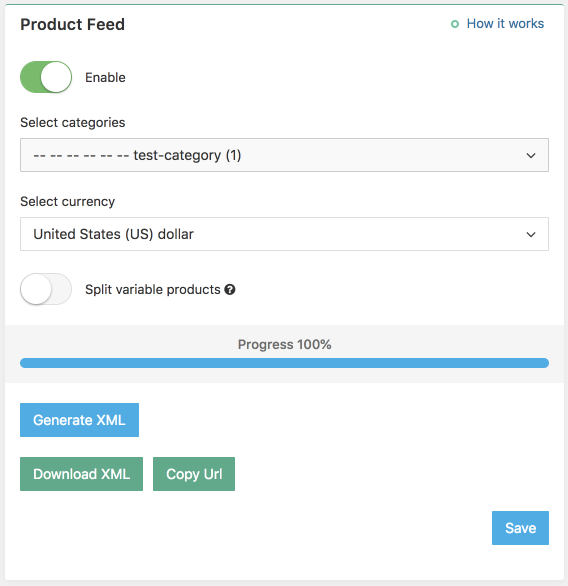 Now you can Download XML file or Copy Url with your product dada feed. You can use download XML option if you have not more than 1000 items in your store and you don't make changes in your product data frequently. Using XML files will not allow to auto update your feed on facebook. If you are using a URL of your feed, you will be able to schedule updates to your feed automatically without uploading XML files. 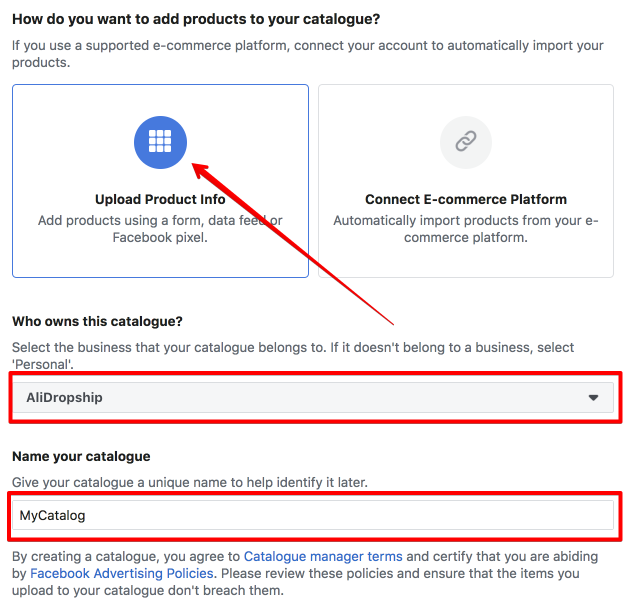 You’ll need to use Business Manager to upload your online store’s product catalog to Facebook. If you have not registered with FB Business Manager yet, please follow these instructions. First, go to your Business Manager account. Click on 'Business Manager' in the top left of the navigation bar and then click 'Product Catalogues' under the 'Assets' header. 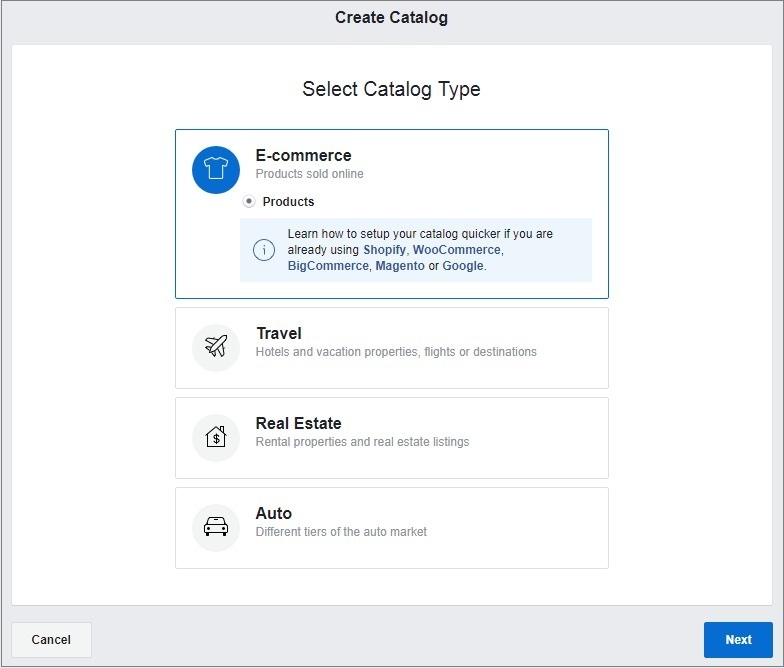 Then click Create Catalog and select E-commerce as your catalog type. Click Next. Select the option 'Upload Product Info', select the owner and name your catalog. Click 'Create'.